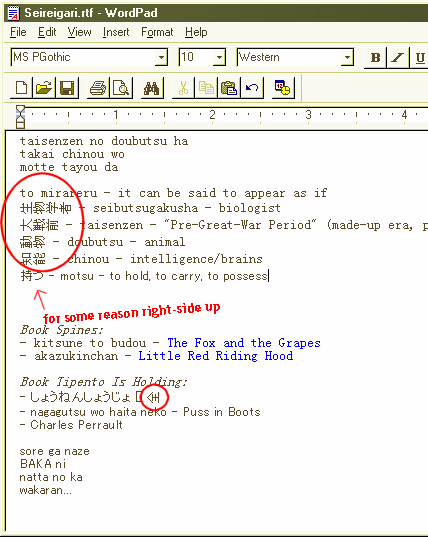 For the last few months, when I type a new kanji into the RTF files I’m doing my translation projects in, 90% of the time it comes out pointing left. My kanji do not know which way is up. I thought at first that the problem was only with @SimSun, which is apparently intended mostly for Chinese, not Japanese, but switching to MS PGothic, which actually has “Japanese” as a language option, doesn’t fix it. Anyway, they both used to work. And I’ve saved and restarted and reopened trying to right them, but nothing changes. This isn’t disabling, since I’m lazy and I either romanize or kana-ize everything before I start the actual translation (the kana work properly), but it’s really irritating. Since I haven’t installed any new Japan\China\Korea\etc.-related software or fonts during this time, I’m going to assume this is something one of the Windows updates did. 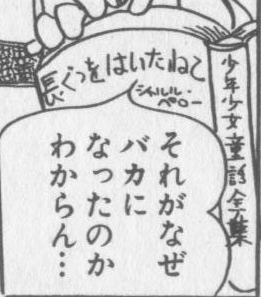 (Edit: And if anyone reading this can tell me what the spine of the book in this image says, and what that title would probably be in English, I would be extremely happy. From the context it’s obviously a children’s book involving talking animals, and Charles Perrault’s name is on the cover, and there’s the phrase “boy(s) and girl(s)” in there.